Abu Dhabi, once a sleepy fishing village, has now grown into a top tourist destination. Abu Dhabi boasts a fair number of luxury attractions such as the Ferrari World and Marina Mall for lovers of luxury. If you are a culture vulture, then don’t miss touring the Sheikh Zayed Grand Mosque, one of the two mosques in the UAE that allow non-Muslims to enter. Culture vultures will also love browsing the colorful traditional lanes of the Heritage Village. Those who love a bit of society will adore the Corniche, where they can rub elbows with the Who’ who of Abu Dhabi. Not to be missed are the fabulous cultural delights of Al Ain, and the peaks of Jebel Hafeet, the call to adventurers the world over. Conclusion- What to Expect from Abu Dhabi? 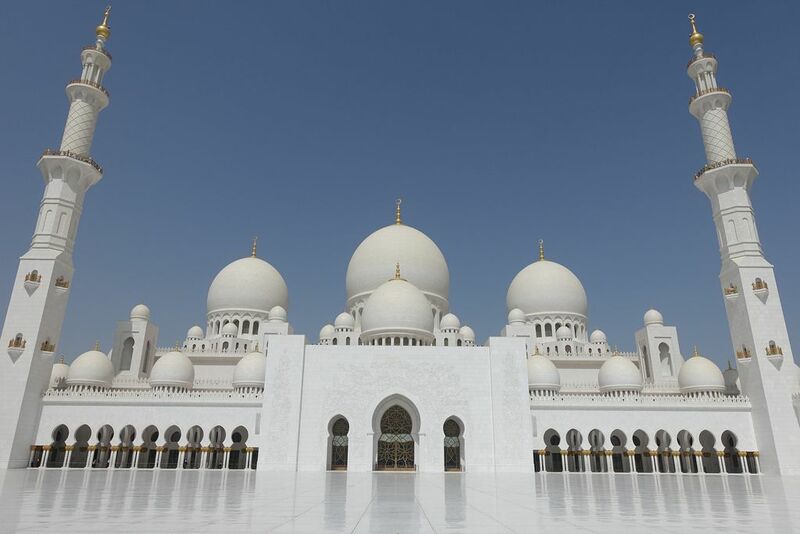 The Sheikh Zayed Grand Mosque is sheer poetry done in the finest high-grade Macedonian marble. 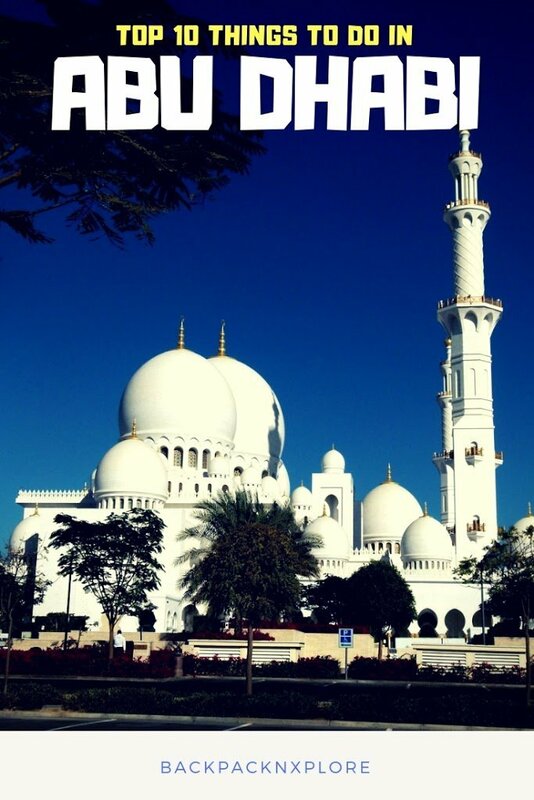 This mosque redefines beauty, and it’s no wonder that it is the designated landmark building of Abu Dhabi. The mosque boasts of intricate glass-work, mosaic tiling, incredible carvings, huge marble pillars, gemstones embedded within carvings and much more. The mosque is home to the world’s biggest chandelier and the world’s largest carpet as well. The mosque can hold 40,000 worshippers at any given time. Visiting this mosque is one of the best things to do in Abu Dhabi. Opening times 9:00-22:00 Saturday–Thursday and 16:30-22:00 on Fridays. Want to get acquainted with the natural side of Abu Dhabi’s steel and glass exterior? 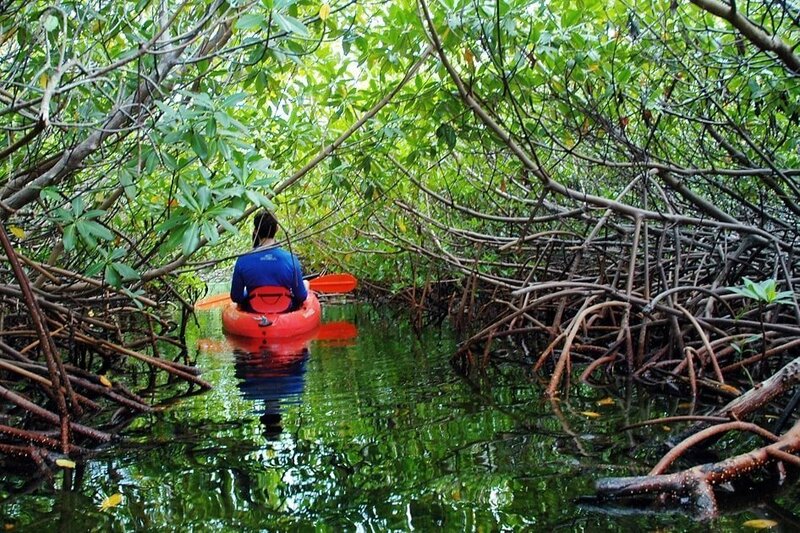 Then go on a kayaking tour of the mangrove forests that cling to the islands around Abu Dhabi. These mangrove forests prevent the corrosion of sand, thus protecting Abu Dhabi’s landmass. You can sign up for a short 1.5 hours kayaking tour or the leisurely three hours paddling tour. These Eco Tours help you understand just how important the mangrove ecological system is. Sign up for a night-time kayaking tour and enjoy the immensely beautiful landscape in the moonlight. If you’re a Formula 1 fan, then don’t miss this branded theme park attraction. There are fabulous roller coasters for you to enjoy, including the world’s fastest roller-coaster, Formula Rossa. Kids can try out their driving skills on the Junior GT track. Adrenaline junkies have no dearth of attractions – there’s the Flying Aces roller-coaster, which zooms at a speed of 120 km per hour on a 52-meter loop. This is the tallest roller-coaster in the world. At Ferrari World, you can also enjoy checking out a collection of Ferrari’s cars, from all the way back as 1947. Book your Ferrari World tour in advance. Sign up for a boat cruise off of Abu Dhabi’s coast for some of the most scintillating views of the city’s glittering skyscrapers. Cruise the marina and around the coast to get a 360-degree view of the city’s skyline. If you like, you can take a tour of Abu Dhabi’s islands, with some beach fun and snorkeling thrown into the mix. There are special sunset cruises with dinner on board which you will enjoy, just as dusk sets over the city. You can book a guided boat tour at the best prices online. Abu Dhabi does not have another Burj Khalifa, but there are places from where you can obtain amazing views of the city. One such famous place is Observation Deck at 300, which is the highest point in the city. It’s located on the 74th floor of the Jumeirah at Etihad Towers hotel. You’ll have to pay an entry fee if you’re not staying at the hotel, but you can redeem the price for food and drink at a café on the observation deck. Enjoy high café at this restaurant, 300 feet above ground, with the city spread below you. It’s one of the greatest highs to experience in Abu Dhabi. When it’s hot as hell in the city, where do you go? You go to the blissful Al Ain Oasis, where you’ll find 3,000 acres of date palms – about 150,000 of them, throwing their shadows on the ground. It’s cool under these towering trees. Check out the ancient irrigation method known as “falaj,” which the oasis management uses to water the orange, fig, mango and plantain trees. The Palace Museum is right next door if you want to explore it. Explore the oasis on foot, enjoying the contrast between it and the desert that surrounds it. Book a tour that fits your budget. The Corniche is a beachside boardwalk that stretches nearly 5 miles along the coast of Dhow Harbour in Abu Dhabi. The Corniche stretches from the Heritage Park all the way to the Emirates Palace. This lovely seaside promenade is lined with some of the city’s most famous skyscrapers, plus a range of restaurants, malls, and shops. You can also enjoy wonderful views of the Persian Gulf and the city skyline. Rent a bicycle and ride along the Corniche and enjoy watching people lounging around, playing volleyball, enjoying free concerts and enjoying themselves. The deserts of Abu Dhabi are located in the western part of the city, surrounding the Liwa Oasis. The desert here is called the Rub Al Khali (Empty Quarter), the world’s largest land mass. Here you can enjoy various desert safari tours, such as the Morning, Afternoon, Evening and Overnight desert safaris. You can enjoy dune bashing, quad biking, sand boarding and more. You can dress up in Bedouin robes and ride a camel if you like. The Jebel Hafeet rises 4,000 feet from the Arabian Desert, about 15 miles south of Al Ain. It’s the tallest mountain in Abu Dhabi and the second-tallest in the UAE. Several important fossil discoveries were made here, all the way from the Bronze Age. Plus, more than 500 burial sites were unearthed at the Jebel Hafeet foothills. If you’re into rock climbing, hiking, mountaineering, and paragliding, you’ll love to explore this mountain. A number of tourists drive up to the summit, on roads that are carved via the limestone; at the summit is the Mercure Grand Jebel Hafeet hotel. You can even visit the Al Ain Camel Souq, which is located at a 20-mile ride from the summit. The Al Jahili Fort is located close to the Palace Museum; it is an ancient fort built during the late 1800s. It is made entirely of mud bricks and was the headquarters of the Oman Trucial Scouts, who preserved peace among Abu Dhabi’s tribes. Explore the watchtowers and battlements, all made out of mud, and also the exhibit dedicated to British explorer Sir Wilfred Thesiger. He is popular in the UAE for his remarkable journeys across the Rub Al Khali (Empty Quarter) desert. Abu Dhabi has a more laid-back feel than Dubai, with its glamorous attractions and its huge collection of skyscrapers. Life in Abu Dhabi follows a smoother, easier pace. While Abu Dhabi offers all the amenities of a modern city, you’ll still find that it holds on dearly to its roots. That’s what gives this city its charm. Visiting the middle-east? 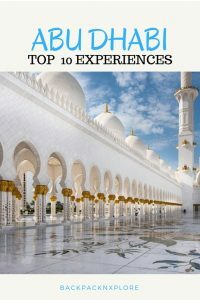 Also read Top 10 things to do in Doha! An avid trekker & explorer, who often takes off some time from her busy life for mountaineering, she loves meeting new people & get attached to their culture very easily. Her ambition is to explore as many places as she can in her life. She strongly believes in Gandhian principle – “simple living high thinking”. I loved working with Neha on this. Check her blog and follow her on Facebook at Facebook for more travel stories. If you liked this post you may also like to read our other city guides for Amsterdam in 3 days, Madrid in 2 days, Antwerp in half a day and Toledo day trip. Subscribe to our blog for your weekly dose of wanderlust! You can also follow me on Facebook and Instagram for your daily dose of wanderlust. Disclaimer – As GetYourGuide Partner I will be eligible for some commission if you book the recommended tours through the links in line, at no additional cost to you. The revenue helps in maintaining the website and keeping the experience ads-free. Abu Dhabi is surely a great place to visit through your lens. It is so smooth and calm. I would love to take a tour and see the green palms. Abhu Dhabi seems to be a good place to visit. Thanks for all the details. Beautiful pics and very informative post. Your post seems really convincing Sinjina. Ever since my parent visited I have been intrigued by Abu Dhabi. One day I shall go. This will help with filling out a full timetable for myself! Thanks so much Laura. I wish to do the same! Would you believe i never knew about kayaking being in Abu Dhabi from last 6 years. Author missed mentioning Emirates Palace, a must visit place. 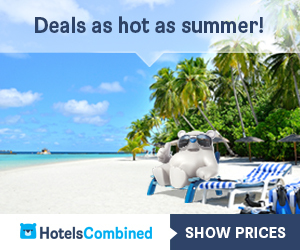 Well there are many new attractions as well like Louvre Museum and Warner Bros Theme Park. I really desire to visit Abu Dhabi. Hopefully, your tips would help when i finally visit. Al Ain and Jabel Hafeetha used to be our favourite week end retreats when we were in Sharjah. Abu Dhabi, as I remember is a quite, sophisticated city! Thanks for sharing and taking me on a nostalgic trip. Thanks Kinshoo, these were the author's choice of top 10. I came to know about the Louvre Museum while browsing online. Emirates palace is a hotel right? A really wonderful place to visit, it's one of the very few places I haven't been to in the Middle East. The Sheikh Zayed Grand Mosque is simply breathtaking. And I never would have thought about a kayaking tour in Abu Dhabi! I am keeping this list for my future reference to Abu Dhabi. Heard so much about the grand mosque, the Ferrari world center and Desert. You list amazed me as it has other attractions too such as cruise and Kayaking tours. Had no idea that you could kayak in mangroves in Abu Dhabi. This post definitely makes me want to go there. Such a great article by Neha. 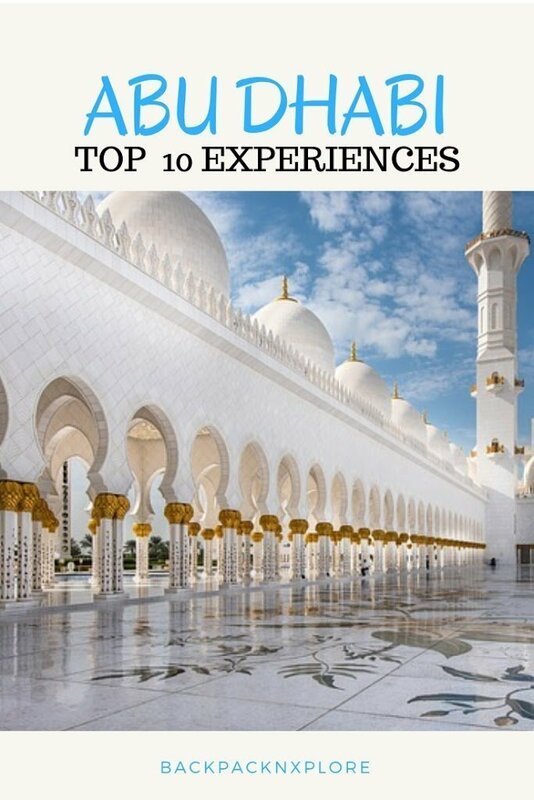 She covers everything I would want to see & experience in Abu Dhabi, especially Sheikh Zayed Grand Mosque! I must admit Abu Dhabi has not been high on my list. I do love reading about it and seeing the photos here. The Sheikh Zayed Grand Mosque is gorgeous!! We also love trips in mangroves. 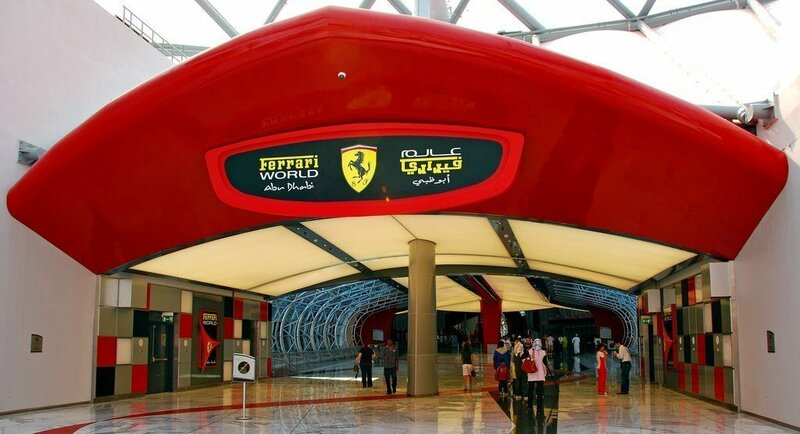 My husband is a car fan so I am sure he would like Ferrari world. Boat cruises and skydecks are tops on our list too! Looks like lots of good reasons to visit. I never would've expected a mangrove kayaking tour to be something you could do in Abu Dhabi! That sounds like a lot of fun though, as does everything else on your list! That mosque is so beautiful! 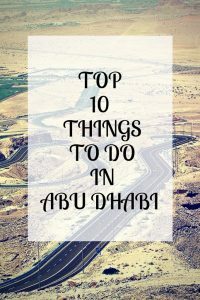 I lived in Abu dhabi and definitely these all places are my favorite places. Ferrari world is really very adventurous and my boys loved it. Strolling around Corniche or taking dhow cruise with stunning skyline views are also wonderful here. Visiting Alain and drive on Jabal Hafeet is also my favorite activity here. My friend was just in Abu Dhabi and I feel like he missed SO MUCH after reading this post! Aside from the clear attraction to roller coasters at Ferrari World, I wouldn't have even thought about paragliding here. Desert treks are one of my favorite things as it brings a whole different scenery and atmosphere that we don't get in other places. I also like there there are places that offer look outs over the city to get new perspectives. 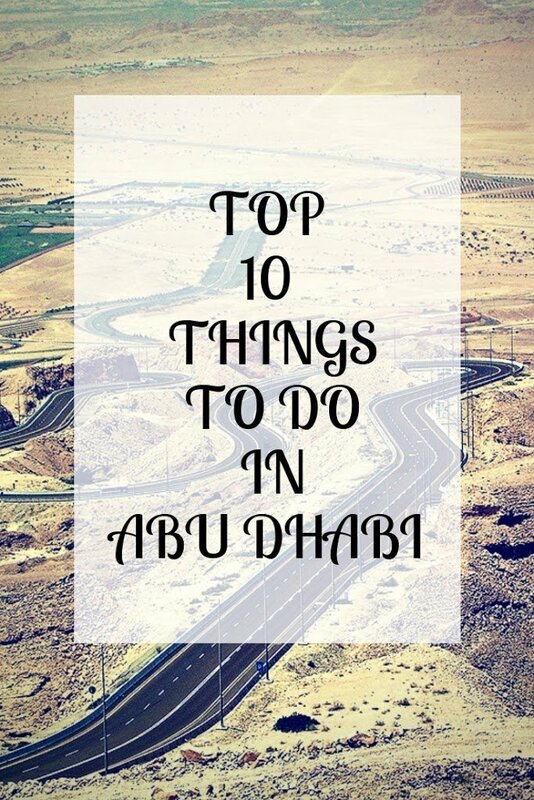 It is a perfect list of top 10 things to do in Abu Dhabi! I live in Dubai and keep visiting Abu Dhabi frequently. I like that you have included Jebel Hafeet in your list as well as Al Ain. Some people might also like to include Louvre in that but I am not much of a museum enthusiast, I am more into nature and beaches. I love the Saadiyat beach as well, it is gorgeous! I visited the UAE before but never made it to Abu Dhabi. I would love to visit someday and this post sure is a great starting point with some awesome suggestions. The desert trek exeprience sounds amazing too, I’m a big fan of it. So now I understand why people that don’t look Muslim could take pictures in the Sheik Zayed Grand Mosque. They let the non-Muslim to enter. Coming from the country with the populous Muslim in the world, I found it really special. Although visiting Abu Dhabi is not high in my list, I found Abu Dhabi is impressive with all it has to offer to visitors.